Although Illustrator was never intended as a layout and typography program, it can certainly be used for simple multi-page documents. In this example, the structure for a trifold brochure will be created. Create a new file by either clicking New, or using the keyboard shortcut, Ctrl+N. In the dialog box, set the Unit of Measurement to Picas. Picas is the standard unit of measurement in the graphics industry. The conversion is 1 inch = 6 picas. For a standard trifold using an 8.5" x 11" sheet, starting with picas makes the math easier. Set the Width to 22 and the Height to 51. 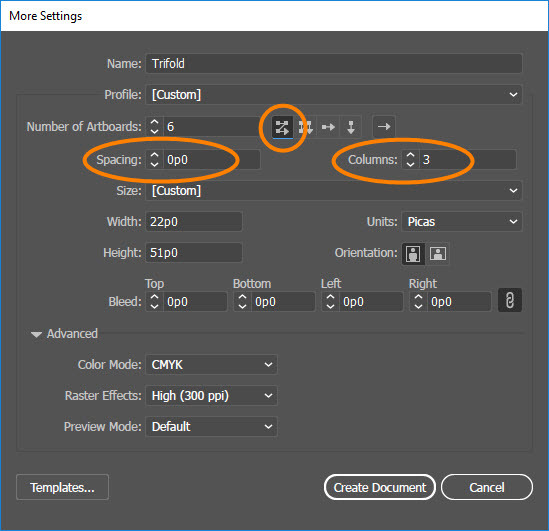 Set Artboards to 6 and Bleed to 0 on all four sides. When you type "0", Illustrator will convert it to 0p0, which is the correct expression in picas. Click More Settings. 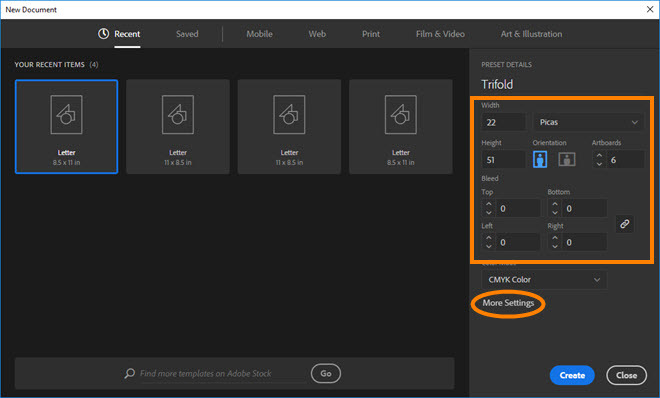 CS 6 users, your dialog box will look like that shown in Step 3, so after you apply the settings in this step, you won't need to click More Settings. In the next dialog box, ensure Grid by Row is selected. Set the Spacing to 0 and Columns to 3, then click Create Document. The layout below shows the structure. 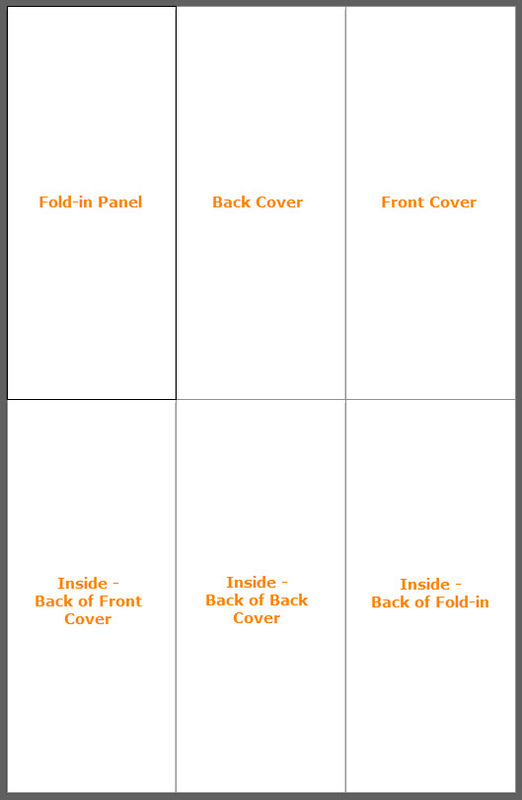 In order for the finished piece to fold correctly, the fold-in panels need to be a little narrower. You'll also want to create a little space between the two rows of panels. 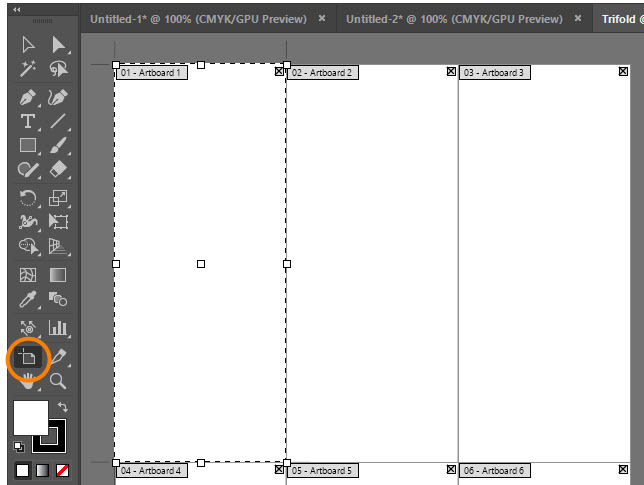 Select the Artboard Tool. 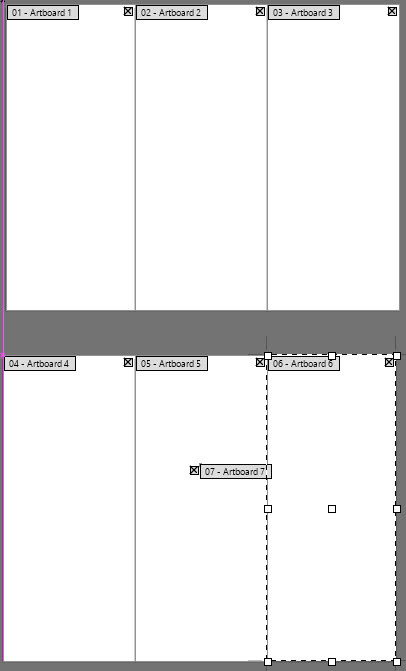 Click on Artboard 1, then go to the Options Bar. Set the Reference Point to the right-center, then change the Width to 21p6. Click on Artboard 6. In the Options Bar, change The Reference Point to the left-center, then the Width to 21p6. Show the rulers, if necessary (Ctrl+R). Right-click on either the horizontal or vertical ruler and change the unit of measurement back to Inches. 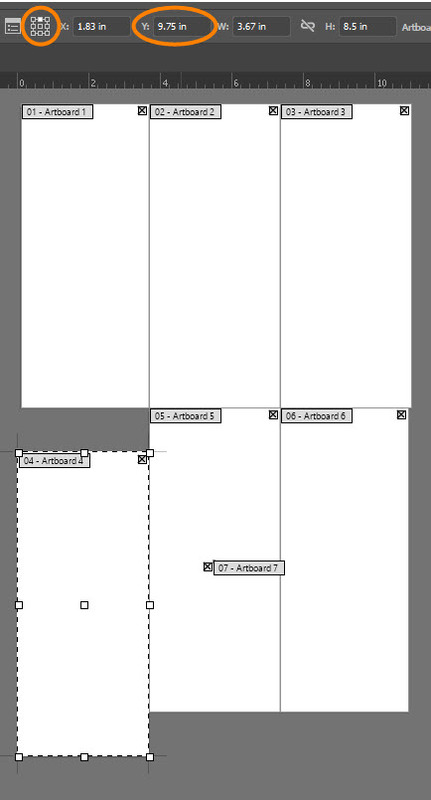 Click on Artboard 4, then go to the Options Bar, click the top-center Reference Point and set the Y value to 9.75. Repeat Step 9 for Artboard 5 and Artboard 6. You may want to create margin guides. Select the Rectangle Tool [ ]. 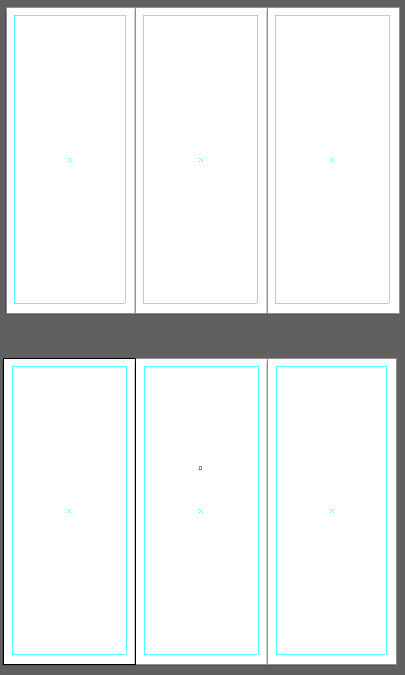 Create rectangles at the desired size and position for the margins on each of the six panels. 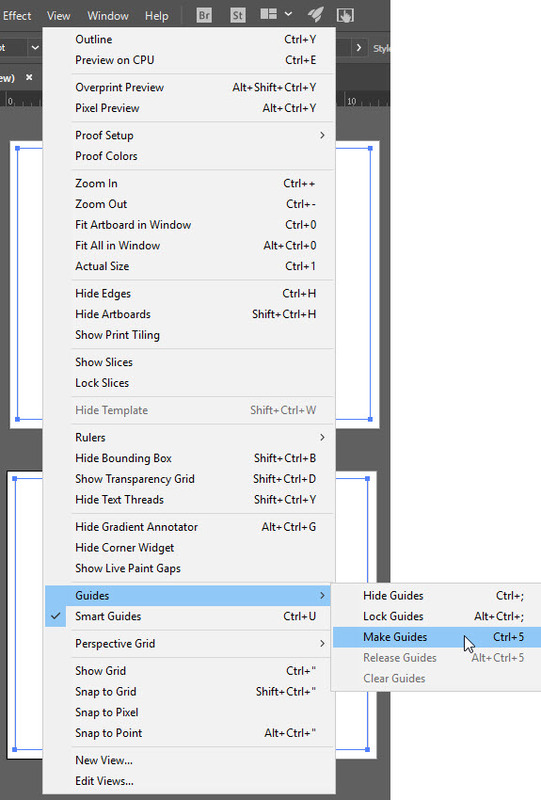 Select all six rectangles, then go to View > Guides > Make Guides. Click on the pasteboard to deselect and you'll see that the rectangles have changed to the cyan color of guides.